Who was Mother Mary Theresa? 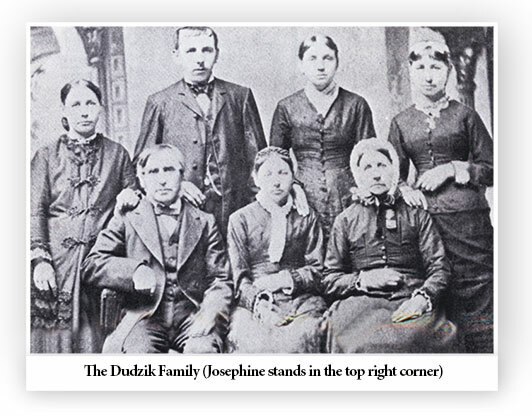 In 1881, Chicago welcomed a young woman, Josephine Dudzik, and her family who had emigrated from Poland. They settled in the vicinity of the well-known St. Stanislaus Kostka Church on the city's vibrant northwest side. A generous, compassionate, and devout woman, Josephine was moved by the condition of the aged, poor, abandoned, and orphaned whom she encountered in her neighborhood. She came to their aid spiritually, physically, and emotionally, even sheltering some in her own family home. 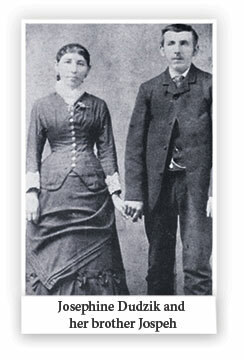 During Chicago's severe financial crisis of 1893, which resulted in greater economic stress and unemployment, Josephine upon the advice of her pastor formed a religious community to come to the aid of the elderly and those in need. 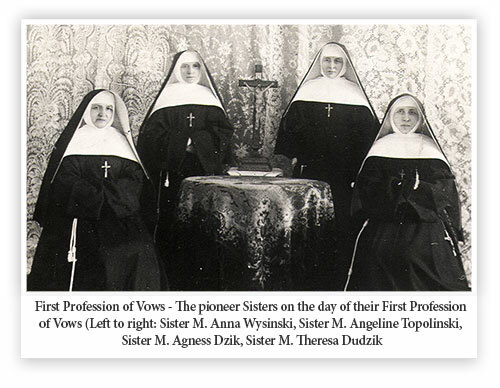 Thus, on December 8, 1894 the Congregation of the Franciscan Sisters of Chicago was born, and Josephine Dudzik was called Sister Mary Theresa. 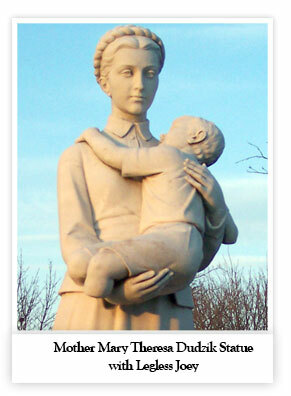 Sister Mary Theresa received the honorary title of 'Mother' in 1948 twenty-two years after her death. 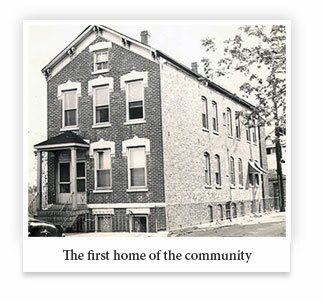 For more than 100 years, imbued with the spirit of Mother Mary Theresa, the Franciscan Sisters of Chicago have responded to the needs of God's people and have served in various ministries, the care of the elderly and the sick in hospitals and nursing homes: providing housing and services for residents of independent, assisted living, and skilled nursing facilities; the operation of child care centers; teaching in elementary and secondary schools and universities; pastoral care; social service work; and sheltering victims of domestic violence. Today, these ministries are continued through the Franciscan Sisters of Chicago Service Corporation. Mother Mary Theresa died in Chicago on September 20, 1918. 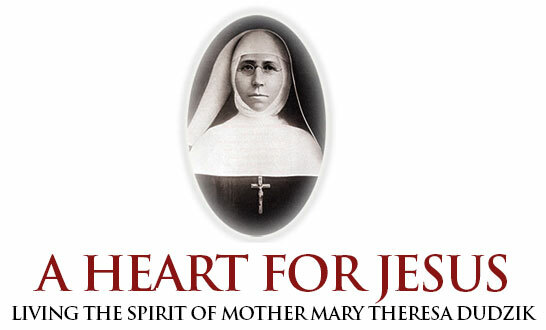 Because of the heroic virtues evident in her life, she is now a candidate for sainthood. 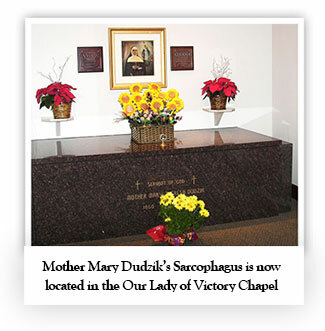 Her remains, brought to the motherhouse of the Franciscan Sisters of Chicago in Lemont from St. Adalbert Cemetery in 1972, were sealed in a granite sarcophagus in the Sacred Heart of Jesus Chapel. The cause for her beatification and canonization is actively being pursued. We pray that Mother Mary Theresa will be recognized a saint in the Catholic Church and serve as a model for all Christians. Mrs. Agnes Dudzik blocked the doorway, eyeing her daughter and an old woman, a stranger, on the front step. It had begun to snow. Josephine had wound her own scarf around the stranger's head and neck. The old woman coughed. Josephine tossed back her brown hair. her blue eyes sparkling up at her mother. "Father Barzynski says she needs a place to stay." "Always a place to stay," Mrs. Dudzik murmured, stepping aside - "and always our place." Josephine and Mrs. Dudzik helped the old woman into the house. Josephine brought home elderly women and young girls who had no place to stay. She loved to bake cakes for them, serve them tea, and teach them how to pray. If they needed something, she found it for them. Once, she stayed up all night hand-sewing new habits for every sister in the convent. Her love for people came from her love for Jesus. Her heart belonged to God. One day Josephine brought home a little boy with no legs. His name was Joey. She taught him the catechism and prayers. She carried him everywhere. Josephine believed that Jesus had chosen her in a special way to serve those in need. Jesus' call gave her peace and filled her with purpose and joy despite the difficulties she encountered. She responded with her whole heart, body, and soul. 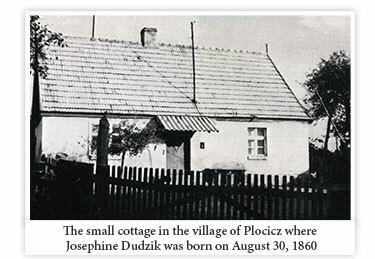 Growing up in Plociz, Poland, Josephine hummed tunes to herself. She was a happy girl, shy, pious, courteous, loving, and generous. She shared what she had with others. Josephine was praying to find a way to help the poor and needy, and was looking for other young women to help her achieve this ministry through the Secular Franciscan Order. Father Barzynski, her spiritual director and pastor, asked her to found a community dedicated to a common life of prayer, labor, and service to poor girls and needy women. "Father Barzynski demanded a promise from me to care for this community in times of difficulty as well as in times of prosperity. When I made the promise, I did not foresee any problems. Later, when difficulties and adversities did arise, I remembered my promise. Consequently, I was able to bear hardship more easily." In Chicago, Josephine joined the Third Order Secular of St. Francis. The order continued to shape her love for Jesus. It strengthened her will to serve others at St. Stanislaus Kostka Church. Her dream became to follow the opening words of the Rule of St. Francis: "Observe the Holy Gospel of Our Lord Jesus Christ living in obedience, in chastity, without owning anything of their own." It was as a member of the Third Order Secular of St. Francis that Josephine would later found the Congregation of the Franciscan Sisters of Chicago. Mother Mary Theresa, in the history of the congregation As God Shall Ordain, is described as one of "unyielding faith, quiet fortitude, gracious but modest manner magnanimity, a generosity of heart, and elevation of soul." Mother Mary Theresa's charisma - her personal gift or grace given by the Holy Spirit for the good of the Church - was to be wholly herself in Jesus as she reached out to others. Like St. Francis of Assisi, the "little unlettered man," it was what she was "that made what she did worthwhile,"
The life and spirit of St. Francis of Assisi taught Mother Mary Theresa to live the Gospel life. She is learned to be guided by the spirit of Jesus who compelled her to loving service to God and neighbor. Franciscan virtues became Mother Mary Theresa's own - humility, faithfulness to duty, simplicity, modesty, simple living, and reverence for all created things. The spirit of St. Francis taught her to love all human beings as her brothers and sisters -and to celebrate each day joy fully as God's gift. When the Franciscan Sisters of Chicago began, the Sisters chose Mother Mary Theresa to be their religious superior. "We love her kind and gentle ways." they said, “We love her natural leadership and her compassion. We trust her." "At times, I felt such a great yearning for Jesus in the Blessed Sacrament that I was ready to run to the church at any time, even late in the evening." Mother Mary Theresa had a great devotion to the Holy Eucharist. She disciplined herself in the imitation of Christ out of love for Him, and always worked at being transformed by God's grace through the Holy Spirit. She committed herself in a new way to the Blessed Virgin Mary, Christ's Mother, and to the doctrine and sacraments of the Church. Mother Mary Theresa believed intensely that the Liturgy of the Eucharist, meditation, and prayer were essential to her union with Christ. Through suffering and hardship, Mother Mary Theresa matured in Christ. 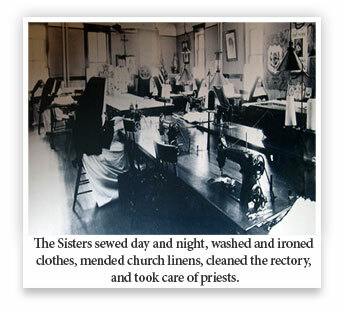 The Sisters sewed day and night, washed and ironed clothes, mended church linens, cleaned the rectory, and took care of priests. This was how they could bring in money to buy food and supplies for the old and infirm residents of their home. Later, to maintain harmony and act as a role model for the others, Mother Mary Theresa took on the hardest tasks, herself. "I say this not to praise myself, but to admit God's ready assistance. When it was necessary to sacrifice myself to bring about peace, I did not hesitate. I trusted in God and he came to my aid...I was able to cultivate such love for this task that I remained fulfilling it, without a break, for nine years." The Sisters rose at 4:30 in the morning to pray. They meditated and followed spiritual disciplines throughout the day - the daily examen, the Way of the Cross, the Rosary of the Seven Joys of the Blessed Virgin Mary, litanies, novenas, holy hours, and silence at designated times. Mother Mary Theresa especially enjoyed reciting the Little Office of the Blessed Virgin Mary. "Despite all the difficulties and trouble I endured, I never felt completely exhausted. My greatest joy was to kneel down to say the evening prayers and rosary with the residents... It seemed to me that God was pleased even with the little good that I could do for His glory. During times of testing, the Holy Spirit remained close to Mother Mary Theresa. By His grace, God encouraged her and strengthened her faith. She then worked even harder for the survival of the community. "In spite of any adversity, I maintained my happy disposition since I saw the will of God in all of life's events...Although I loved to sing very much, there was no joy in my singing, at least not such a sense of jubilation as I had experienced while I was living alone with my mother. When something occurred to make me unhappy, I offered it to Jesus and simply hoped for the best." Mother Mary Theresa was always honest with her doubts and fears. To be faithful to Christ did not mean denial of troubles. Rather it meant to face all of life's challenges with realism and with open eyes. She knew that her spiritual walk had valleys as well as meadows and flowers. God always seemed close to her when she was afraid. "I was overcome with a kind of misgiving, I knew that it would not be easy to learn how to be a good religious. How could I impart such knowledge when I myself was simple and uneducated both in spiritual and secular matters? I considered myself a fool and recognized my need of education in the proper techniques to guide others. Nevertheless, I only wished that God's Will be done. I place all my trust in Him and would readily submit to His designs. Sister Mary Theresa never took God's goodness and kindness for granted. She was filled with gratitude for all that God brought to her in life. 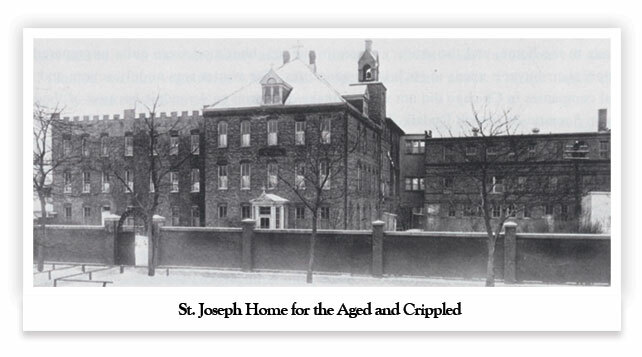 During the struggle to build the first St. Joseph home for the aged and crippled, she went out one day to inspect the building. "As soon as I was able to see the skeleton of the building, I was overcome with fear and happiness. My heart was filled with gratitude to God. I then ascended the ladder to the top of the building in order to see the progress made so far and to pray. No one ever saw me but God to whom I felt so close at that moment. When I realized that here, on this site which seemed to have been chosen by God Himself, so far from any church or people, the Holy Sacrifice of the Mass would be offered and glory given to God, I cried from joy. It was the shortage of bread and other foods which could not be obtained in sufficient quantities for the demands of our aged and the Sisters. The only grocery store in our neighborhood was unprepared to supply our needs. The source of worry was to procure enough food for everybody. It seemed to me that with the help of God I would be capable of accomplishing everything. 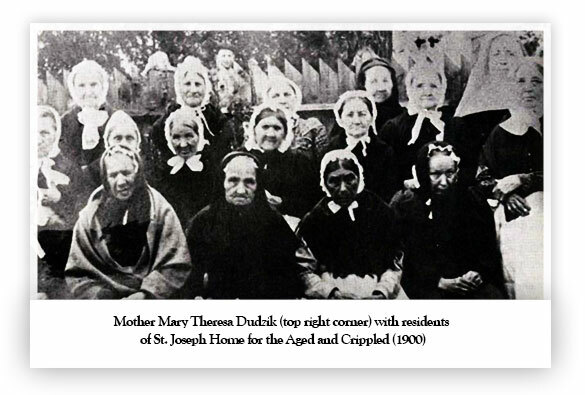 During the early days of the order, Mother Mary Theresa and her group of Sisters experienced severe poverty. In this, they suffered like St. Francis. But also like St. Francis, they practiced absolute confidence in God's power, sovereignty, and love to take care of their needs. One winter day a wizened old man came across Mother Mary Theresa and Sister Mary Anna, herding a cow and two pigs up a street near the stockyards against the cold Chicago wind. "What are you doing?" the old man asked. One of the Sisters, her blue eyes sparkling, smiled at him from under her black veil. "We are taking these gifts of God to feed the hungry and the poor." They told the old man about St. Joseph's home in Avondale. "That's over ten miles from here!" the man exclaimed. Mother Mary Theresa said that God would give them strength for a long walk home. The Sisters trudged on, urging the cow and pigs forward. Josephine's heart for Jesus grew through the light of two teachers - St. Francis of Assisi and St. Francis de Sales. Mother Mary Theresa learned from St. Francis de Sales to cast her heart into God's huge love, which embraces all human beings. 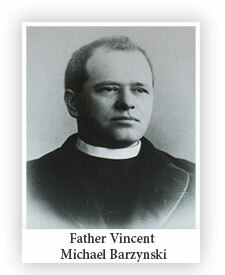 "I began to present our difficulties to Jesus more frequently and to seek help from him alone." Holiness for Mother Mary Theresa meant the loving fulfillment of one's duties day by day. Each day became another journey into God's infinite love. Only through Jesus was she able to act in love toward the frail old men and women at the Home. 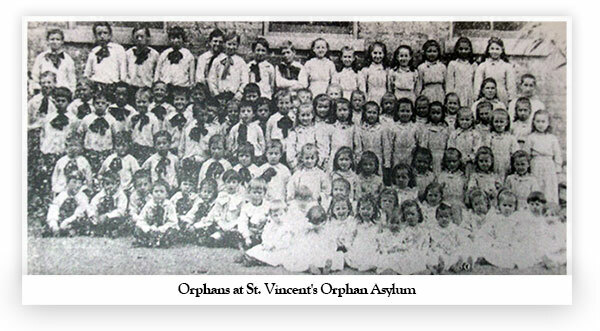 Only by imitating Jesus was she able to embrace in love all of the orphans who soon came to live at St. Vincent's Orphan Asylum. Sharing God's light meant showing the novices what to gain in all richness, how to grow in charity, how to be positive and optimistic, how to sing (as much as one could) even when the organist hit the wrong keys! She taught the next generation of Sisters to pray as St. Francis of Assisi prayed - all day, every day. You must have a spirit of prayer, or you will find it hard to persevere. Pray with great faith in God, and God will take care of everything. Jesus remained close to Mother Mary Theresa in many ways, especially during the days when her vision for the community was resisted. Some balked at her "rules," Others quarreled. Others were unkind to her. But through it all, Mother Mary Theresa showed patience. I became accustomed to their murmuring since I had borne it already for six years. In a way these criticisms of my conduct were no small advantage for my pride. I would want to bear more as long as God would not be offended, and I would consider it even great happiness to be able to suffer for the greater glory of God and the good of this Community. "I bruised my hands many times while doing the work that had to be finished." Mother Mary Theresa could not have anticipated all the ways in which God would grow her heart for Jesus. There were days when even she doubted her calling, and she longed for the serenity of the home where she had lived alone with her mother. But she never game up. Jesus gave her strength and courage to continue. "I reassured myself with the thought that whatever I did, I would do for the greater glory of God...As long as I loved; I would try as much as my strength allowed, to sustain the community and persevere in it." Mother Mary Theresa was above all obedient to Christ and to her spiritual director. On the day that Father Barzynski deposed her from her role as superior of the community, putting her friend Sister Anna in her place, Mother Mary Theresa reported simply and without bitterness, "A change of superior took place." Later, she told the Sisters, "This is what God wants of me." She accepted the decision quietly, submitting her mind and heart, as always, to the sovereignty of God. During that moment of crushing humiliation - and on later occasions when she was passed up for leadership - her obedience did not waiver. She spent the later years of her life in obscurity, as the least of Sisters, working in the laundry, the garden, cutting flowers in the greenhouse, sewing church linens. As she was teaching others obedience in the community, so she modeled obedience with acceptance and peace. "Now that the burden was taken away from me, it suddenly seemed as though a heavy stone fell from my head, and very often I perceived unusual happiness." "Give yourself to Jesus. Let Jesus teach you." Mother Mary Theresa embodied humility. Most of the novices she taught never knew that she was the foundress of the community. She never talked about herself. "I often chose the hardest tasks. I say this not to praise myself, but to admit God's ready assistance. As much as I was able to, I reassured myself with the thought that whatever I did, I would do it for the greater glory of God." Mother Mary Theresa did not die suddenly. Her death from malignant cancer, her "crown of thorns" was a struggle, difficult and painful. Her dying took courage, stamina, and prayer. Yet through it all, she shared with others with joy that only Christ can give. It always happens that when God sends sorrow, He also sends consolation. The Sisters who waited on her day and night said that she was in unbearable pain during the final months of her life. Yet she often smiled, turning her pain over to God's Divine Will. Let all this suffering be for God. Each day, Mother Mary Theresa's concern was not for herself, but for her community. She prayed that the Sisters would bring glory to God through a closer walk with Him. 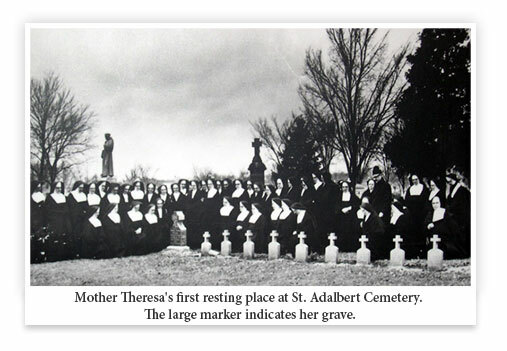 Last rites were given in the early morning of September 20, 1918 and Mother Mary Theresa, surrounded by Sisters gathered in prayer, closed her eyes and died. She left her family behind - 160 members or the Franciscan Sisters of Chicago. The Franciscan Sisters of Chicago, through Franciscan Communities, bring the vision of Mother Mary Theresa into reality each day by enriching the lives of those they serve, freeing them to experience fullness of life. For more than 110 years, the Franciscan Sisters of Chicago have dedicated their lives to providing the people of God with the highest quality of care and services by continuing to respond to the changing needs of the times. The focus today is on the enhancement and expansion of the retirement communities and other senior services. 'That focus includes a deeper emphasis on creating active, enriched lives, wellness programs, and opportunities for freedom and empowerment. 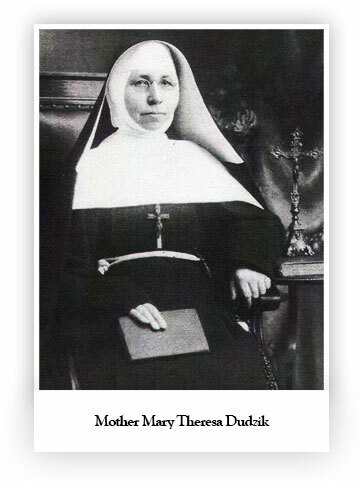 Venerable Mother Mary Theresa Dudzik understood how respect, service, dedication, stewardship, and joy can improve the lives of people of all faiths. She knew that people of every social and economic level might someday find some vital need unmet if the dedicated efforts and support of others were not available. The Franciscan Sisters of Chicago continue to serve the people of God and give witness to the faithful love of God for all of creation through their lives and through the works prompted by their charisma; education; care for children, the sick, and the infirm; parish and other pastoral services; and social services.